Website - Joystiq:Tetris Ultimate for 3DS on November 11th! $29.99 at retailers, $19.99 from the e-shop. 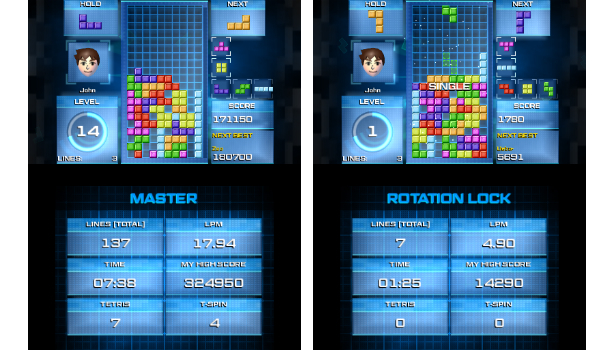 Tetris Ultimate makes a beeline for 3DS on November 11, Ubisoft has announced. The game will launch on Xbox One, PS4, Vita and PC in the winter, locking in a slight delay for consoles, which previously had a summer launch window. On 3DS, Tetris Ultimate is cheaper as a digital purchase, $20 compared with $30 at retail. The digital price reduction makes sense on the surface, since that version doesn't have to factor in costs associated with a physical release, but it is a fairly unprecedented move. The Vita has boasted a few reduced-price digital games in the past, but largely, publishers offer one price for downloaded and physical games. The 3DS version of Tetris Ultimate includes four single-player Challenge modes, as outlined by Ubisoft: "Master" has Tetriminos drop instantly and appear at the bottom, "Rotation Lock" makes the orientations of the Tetriminos random and frozen in one position, "Escalation" has players clear more lines as the game levels up, and "Invisible" makes the Tetriminos invisible as they drop to the bottom.